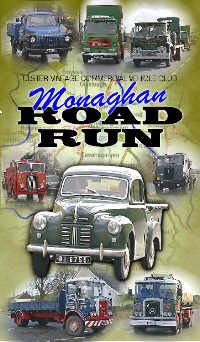 The first road run of the year organised by The Ulster Vintage Commercial Vehicle Club saw almost 30 of the oldest and rarest commercial vehicles ever seen on the roads, of Monaghan and Cavan, go back 'on the road again'. This video tracks these beautiful machines as they wind their way from the Tyrone border through Emyvale, Monaghan Town, Smithboro, Clones, Newbliss and on to the scenic village of Rockcorry via Swann’s Cross for a well earned rest..
After refreshments and a chat the enthusiasts cross into County Cavan, going through Cootehill, enroute to Ballybay where the convoy then heads for Carrickmacross, then Castleblayney, before heading back to the Hillgrove Hotel in Monaghan Town. This video contains informative commentary interspersed with appropriate music as we take a trip back in time on the windy drumlin roads.